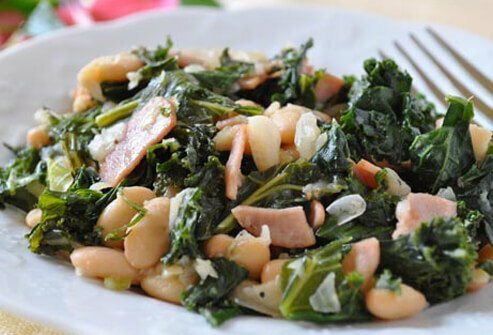 For decades, Italian country cooks have simmered greens and buttery white beans together. A quick version from cookbook author Holly Clegg starts with Canadian bacon browned in a pan. Next, sauté an onion in olive oil. Add chopped kale, a can of white beans, chicken broth, and stir until the greens are tender. Canadian bacon adds meaty flavor with less fat than regular bacon. Bok choy, a mild Chinese cabbage, gives this salad a crunchy texture. 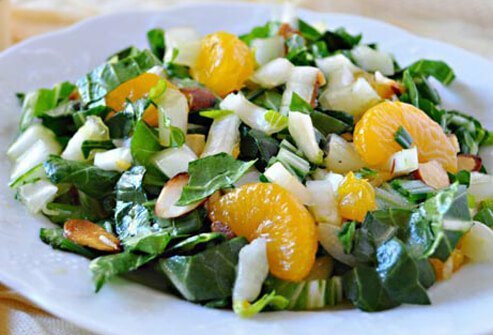 Combine chopped baby bok choy, green onions, toasted sliced almonds, and drained mandarin oranges. For dressing, whisk together olive oil, rice vinegar, sugar, and low-sodium soy sauce. Bok choy has the disease-fighting powers of cabbage and is packed with vitamins and minerals. Want to serve leafy greens like a top chef? 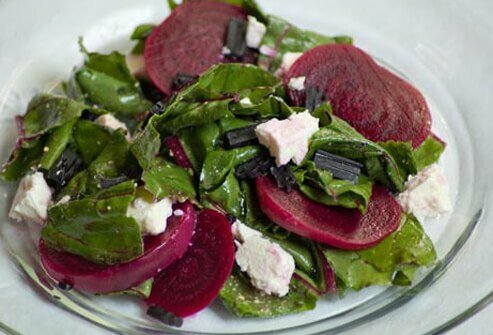 Try a salad of sliced beets and beet greens, the creation of Top Chef All-Stars winner Richard Blais. He tames the bite of the greens with shavings of black licorice. It adds a kick and a false sense of sweetness, like using cinnamon or vanilla. At his newest restaurant, The Spence, he adds a little horseradish as a final touch. Collards have big, wide leaves with a cabbage-like flavor. Chef Blais blanches them briefly in boiling water, then plunges them into ice water. 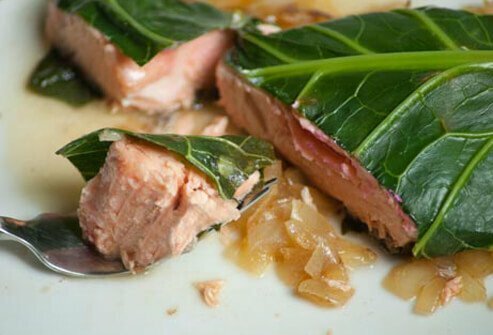 Once soft, fold the leaf over uncooked salmon like a wrap. Steam the fish in the collard leaf until the salmon is tender. Tip: Aim for 2 to 3 cups of veggies daily. Cooked greens like cabbage count as one cup of veggies. For salad greens, two cups are equal to one cup of vegetables. 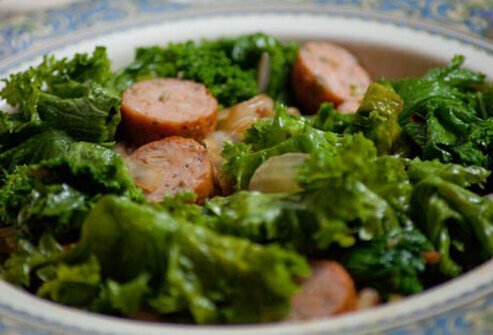 The true Southern way to cook collards -- or the more peppery mustard greens shown here -- is with chunks of ham or Andouille sausage. Recipe developer Clegg, who calls Louisiana home, creates a similar flavor with turkey sausage or Canadian bacon. This cuts the fat and sodium in this favorite side dish. After browning the meat, add olive oil, onion, broth, and leafy greens until wilted. 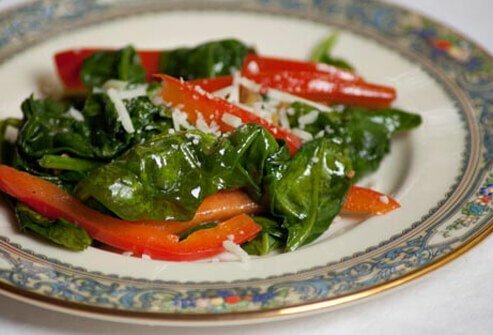 For a classic Italian take on leafy greens, Chef Blais recommends sautéeing garlic with red pepper. Add chopped spinach or kale and finish with a squeeze of lemon juice. Tip: Try bits of kale stems or broccoli rabe in pasta sauce. Chef Blais says the greens add punch and a peppery depth to the sauce. 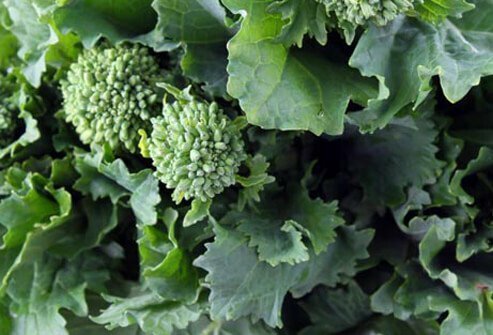 This leafy cousin of broccoli with small buds is popular in Italian and Asian cooking. Chef Blais likes to char it briefly on a grill or under a broiler to retain the flavor. He sprinkles the cooked broccoli rabe with a few drops of Asian fish sauce, anchovy oil, or oyster sauce. They add a savory taste called umami. 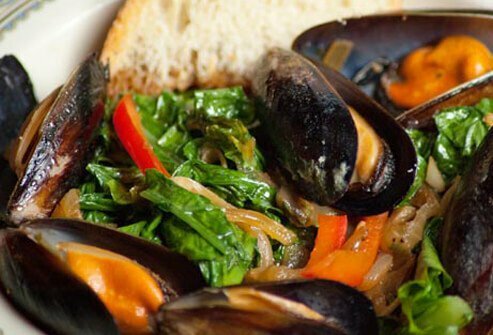 Steamed mussels or clams are a great vehicle for greens. Chef Blais cooks up a Portuguese soup by steaming clams with sherry, garlic, and chopped turnip or beet greens. The ocean sprinkles in its own seasoning, through the salt naturally found in the shellfish. Greens make this soup rustic and filling. This one-pot meal is a lot like stuffed cabbage, but it's easier to make and uses a slow cooker. The recipe, developed by Holly Clegg, starts with ground sirloin browned in a skillet with onion and garlic, and seasoned with pepper. 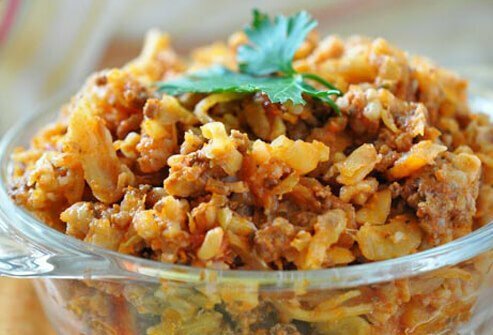 Place the meat, brown rice, chopped cabbage, marinara sauce, and brown sugar into a slow cooker. Cover and cook on low for four to six hours. You won't find mayo in Clegg's sweet and savory coleslaw recipe. 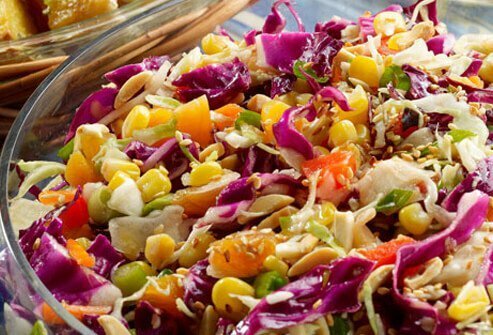 And you may forget you're eating cabbage, thanks to the fruit, nuts, and seeds. Slice red and green cabbage thinly. Add sliced red bell pepper, dried apricots, corn, green onions, slivered almonds, and sesame seeds. Drizzle on a dressing made of balsamic vinegar, honey, olive oil, and garlic. 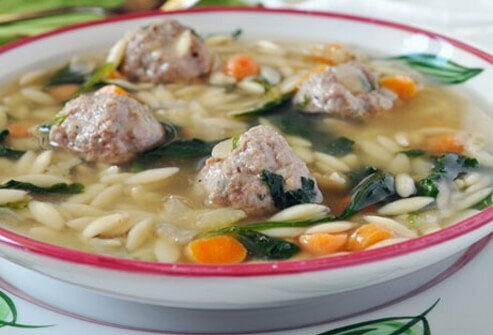 The "wedding" in Italian minestra maritata soup refers to the delicious union of meat and greens. Sauté onion, garlic, celery, and carrots in a large pot. Next, add chicken and beef broth, oregano, and orzo pasta. Bring soup to a boil. Form mini-meatballs with ground sirloin, Parmesan, bread crumbs, eggs, and seasonings. Cook meatballs in the soup. Add baby spinach and simmer until greens are wilted. 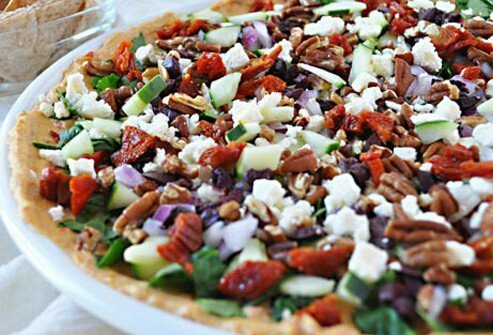 Serve with pita chips. One-quarter cup of dip has about 90 calories. This twist on on Caesar salad comes from Chef Blais. 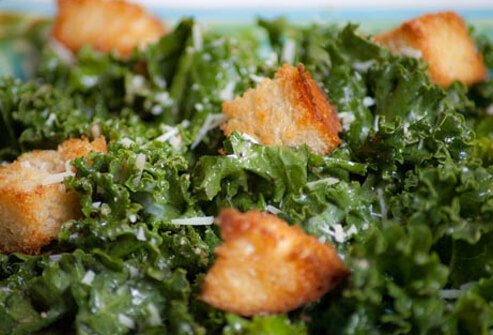 It uses the frilly edges of fresh kale, flavored with Asian fish sauce, Thai chilies, garlic, parmesan cheese, and lemon juice. Richard Blais, chef/owner, The Spence and Flip Burger Boutique. Holly Clegg, author, Too Hot in the Kitchen: Secrets to Sizzle At Any Age, 2010. Centers for Disease Control and Prevention. USDA: "My Plate."